In the Design Competition room at IPP32 this one had me totally flummoxed! I had a couple of attempts at it and literally I got nowhere ... it looks like a burr, and in the beginning it feels like a burr, the pieces moved in a burr-like manner, it’s called a Blind Burr, so it must be a burr, right? There are a few pieces that seem to slide around quite a lot, in fact there’s one in each axis that slides around rather a lot, which might make you think that this is a simple loosey-goosey arrangement that is going to come apart unexpectedly at some point ... and you’d be wrong, on pretty much every single one of those ... except the name. At first it was everything that I remembered: lots of movement, very little progress! 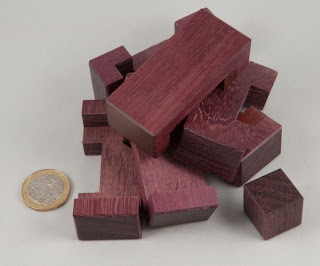 Eventually I noticed something unexpected and explored that a little and found something very intriguing – I hadn’t ever expected burr pieces to behave like that! And yet, when they do, magic happens... and when I opened it, I was amazed at what I saw on the inside – this one is a triumph of simple design that works in a rather strange manner – it’s a delight to solve. Having been shown what I was missing out on, I got home and ordered a copy from Puzzle Paradise ... along with a bloodwood copy of Greg’s Odd Repartition for good measure. They arrived about a week later and I’m delighted with it – I keep picking it up and opening it and then putting it all back together again because it’s so different, and interesting, and fun! 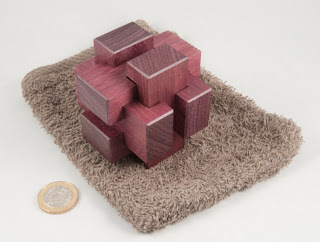 ...and there’s a great little surprise when you solve it and count the pieces ... it’s not quite what you’re expecting! There’s an extra little piece in there ... and that little bit makes reassembly a whole heap easier, while making disassembly significantly tougher – genius! Yet another excellent design from Greg that deserved to be a Top Ten vote-getter in the Design Competition. Bravo mon ami! I love mine! I keep going back to it and get a kick out of it every time! It didn't take long to solve but a truly different burr! Greg Benedetti: "The inside 2x2x2 forbid rotational moves. Those moves do not help for the solving, goal with the inside cube puzzlers can not use the turns, And They are not tempted to use force, so They Can not "hurt" the puzzle. 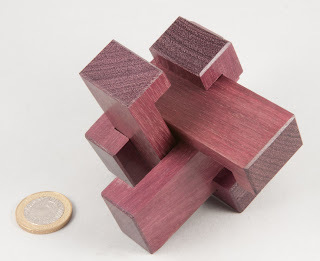 In a metal version, this puzzle Certainly Would Be better without the cube, Because The puzzlers Would Be in front of a very loosely puzzle, with only one feasible way to solve it."